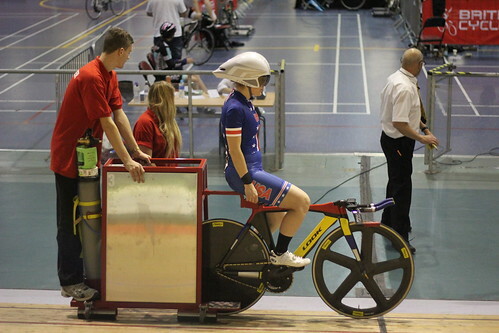 The 2013 Newport International Paracycling Cup – photos and happiness! 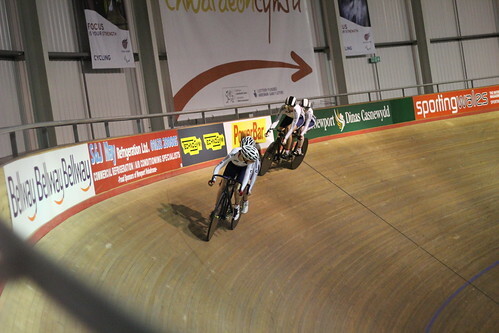 I’ve mentioned before how I can’t believe that there have been no Track Paracycling World Championships or even World Cups since before the 2012 Paralympics, and none on the calendar for 2014 yet, but now I’ve been to live Paracycling, I’m even more amazed, because damn, Paracyling is so entertaining and fun to watch! I knew that, of course, from the Paralympic tv coverage, but just like the first time I went to an able-bodied Track World Cup, seeing it in real life is a different thing altogether. 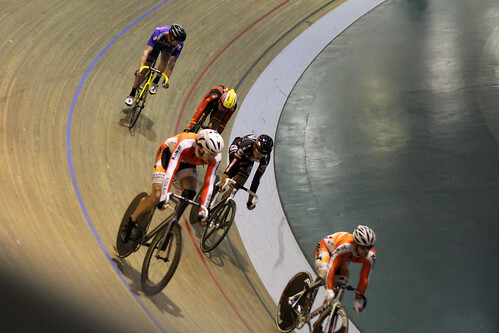 I was gutted that we missed the Saturday sessions, because Sunday’s were spectacular – all the B/VI tandem sprinting, the men’s kilo time trial, the women’s 3km Individual Pursuit, and the men’s 10km C4/5 Scratch race. 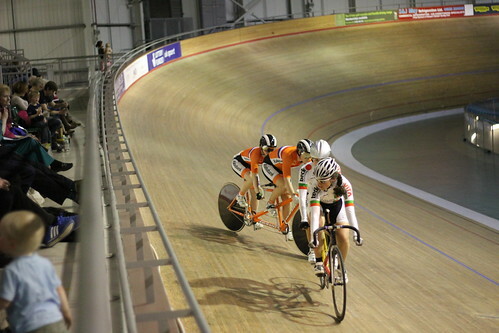 Tandem sprinting is just spectacular to watch. 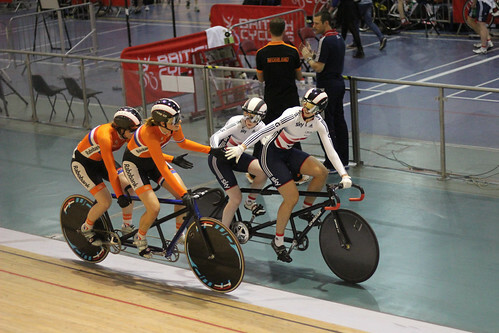 It’s all the same tactics as individual sprinting, with tactics and mind-games, feinting and skilful bike-handling, and top speeds, but on a tandem! It took me a while to stop freaking out, because how those riders didn’t crash, faking each other out and stopping immediately to swoop down and around, or cutting each other up is beyond me. I was gasping and covering my eyes, and cheering and clapping, and loved every moment of it. One of the things I really loved about the meet was how warm and supportive everyone was to each other. 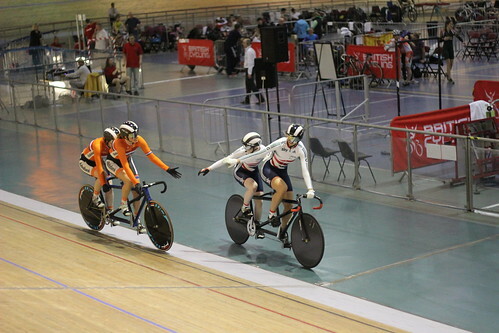 There was this little moment when the British pair, Sophie Thornhill & Rachel James beat Dutch riders Larissa Klaasen & Kim van Dijk, and while it was hard-fought in the race, there was this moment after they finished their wind-down laps, when both pairs reached out, congratulating each other on a brilliant duel, acknowledging each other’s strength. I loved getting to see that, and I heard about it all day from riders’ families in the stands, how the Paracycling world is like a family, everyone supporting and respecting everyone else. My regret for the day was that I kept getting swept up in the excitement of the racing, or with the opportunities to take photos around the banking, so kept missing the final sprints and run-ins to the finish. 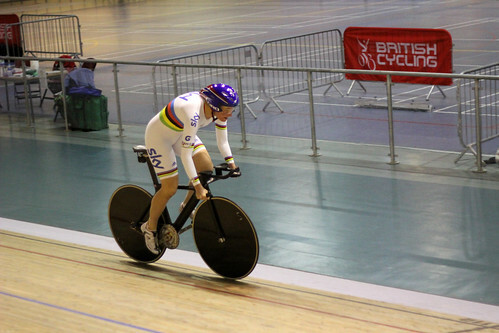 When Jody Cundy broke the C4 kilometre TT World Record, and when he attacked off the front of the C4/5 men’s 10km Scratch race in the final laps, I was cheering and yelling (and probably physically jumping up and down) because it was such exciting riding. 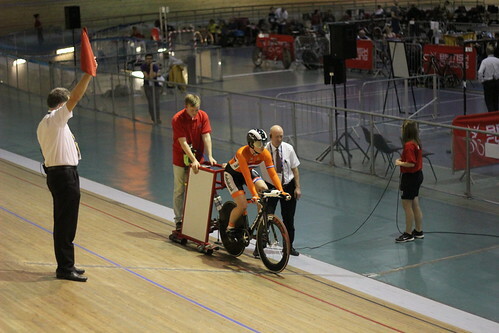 The commentating really helped with this – Chris Furber was the British Cycling lead coach for the Beijing and London Paralympics, so he really knew his stuff, and had that combination of knowledge and enthusiasm and humour that made it so easy to get into every race. 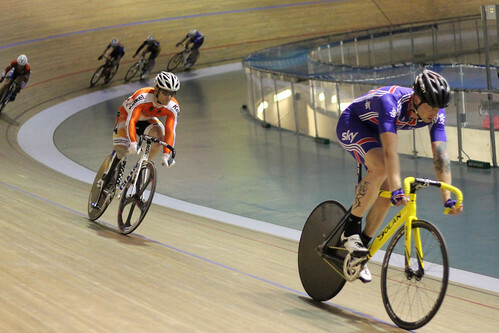 All of that is a tl;dr way of saying if there’s ever track Paracycling near you, go and see it. 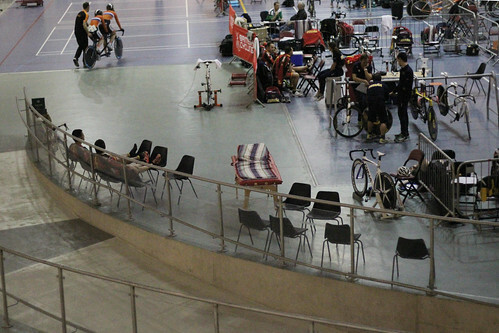 And if you look for Paracycling events in your country and can’t find them, ask your National Federation why – and what they and the UCI are doing about the lack of World Cups and World Championships for the riders. It will be a travesty if the next international competition is a hurriedly pulled-together World Championships in 2016 put on to provide qualification points for the Rio Paralympics. 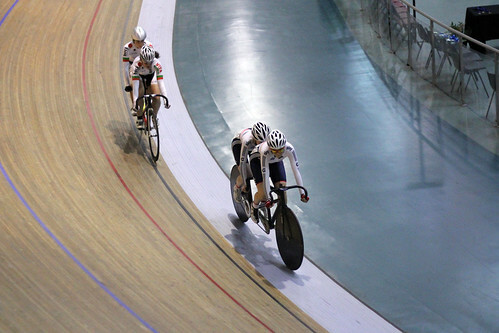 Colin Lynch wrote a great Open Letter to the UCI about all this – please click through and read it – and Jody Cundy and Sarah Storey have some great quotes about the lack of events and the UCI’s rôle, on the BBC website just before the event, please read that, too! I was taking photos with the “wrong” equipment, a fixed 50mm lens rather than a fast sporty zoomy one with a flash, just to see if I could, so if you want to look at my photos, head over to my flickr set, but apologies for those lack of crucial race moment shots. 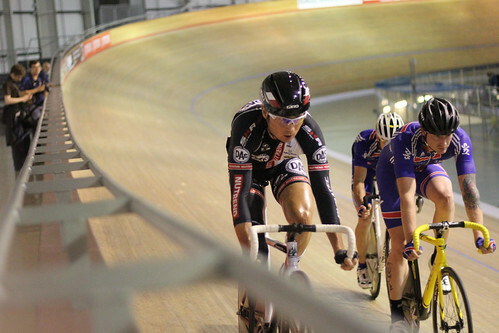 There are some proper photos on British Cycling’s (unsurprisingly) Brit-focused reports from Day 1, Day 2 and Day 3. If you want to know more about some of the women in Paracycling, I wrote two “Celebrating Social Media” posts before the Paralympics last year, here and here. Great photos, Sarah! And for a great cause… the UCI really needs to step it up for these well-deserving riders & athletes. Thanks so much! And yes, absolutely, completely, 100%, they really, really do! We went to the London Paralympic cycling (twice I think), mostly to cheer ourselves up after failing to snag any track tickets for the Olympics, but absolutely loved it! My sister and her husband were doing the ticket tickets search every day, and went to all sorts of stuff, like synchronised swimming, handball, horsey riding, hockey etc – but they loves the Paralympic sports best of all. 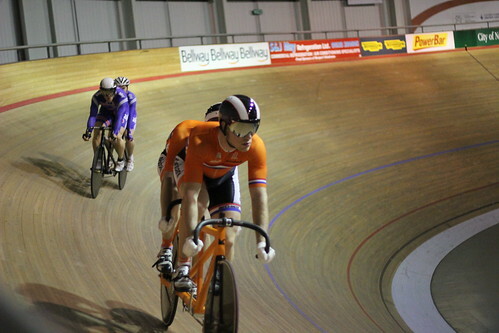 I can really recommend the Paracycling, it’s so super-friendly!